This dialog appears when you import notes in the Piano Roll either from MIDI clipboard or a MIDI file. 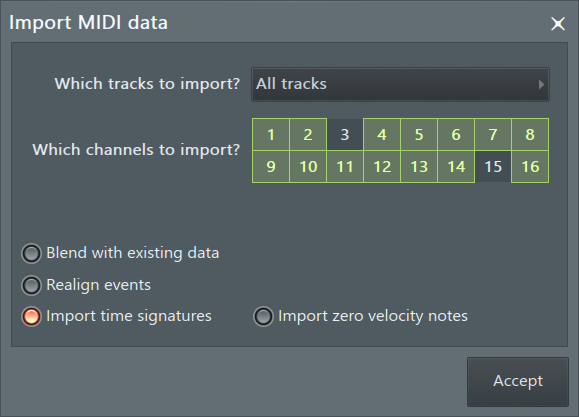 NOTE: There are other MIDI import options available depending on the MIDI import method, see the Import MIDI Data Dialog. Which Tracks to Import - Click the menu box to see a list of individual MIDI tracks to import into the Piano roll. Which Channels to Import - Lets you select which channels should be imported. Left-click a channel number (it will be marked in red) to include it in the imported channels, Right-Click it to exclude it from the imported channels. Blend with Existing Data - When turned on, imported notes will paste-mix with the already existing ones. Otherwise the existing notes will be overwritten by imported data. Realign events - Aligns imported data with the start of the Piano roll. Import time signatures - Add time signatures from the MIDI file to the Pattern / Piano roll. Import zero velocity notes - Treat notes with a velocity of zero as 'Note ON', instead of, the default, 'Note Off' messages. Accept - Accept changes and close the tool. Note, these changes can be subsequently undone using the Current project History or Ctrl+Z.